Since we are already in the 80's and 90's, I have really been working on the yard so I can enjoy it while we can before it gets to be in the l00's. I bought this little bench at a Junk Store about 15 yrs ago for $10. 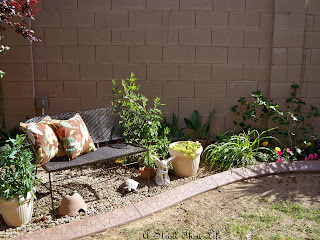 It is just the right size to tuck into a small spot in the yard, howeve it needed a little makeover. ORB to the rescue. That stuff helps anything. 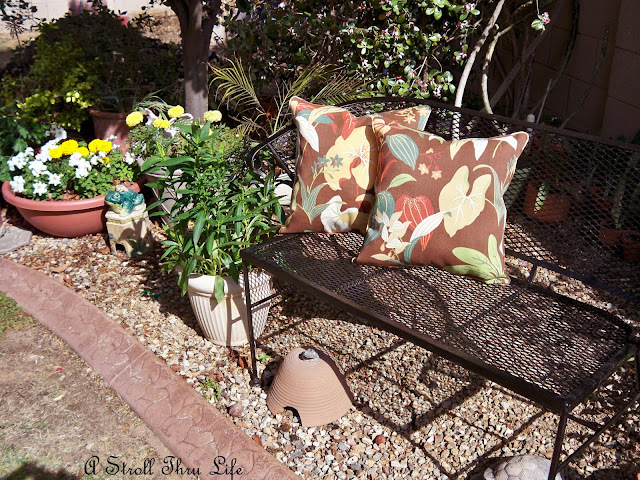 I used some of the free sunbrella fabric my daughter gave me and made a couple of cushions. I think I will also make a seat cushion. Comfy little spot to sit and have my coffee in the morning. My new bushes are trying so hard to grow and my little annuals are hanging in there too. I can't wait until they all grow a little bigger. This is the view I see from the patio and out the sliding glass doors. We have a postage stamp size yard, but I still want flowers and some pretty bushes. This winter really did a number on everything. 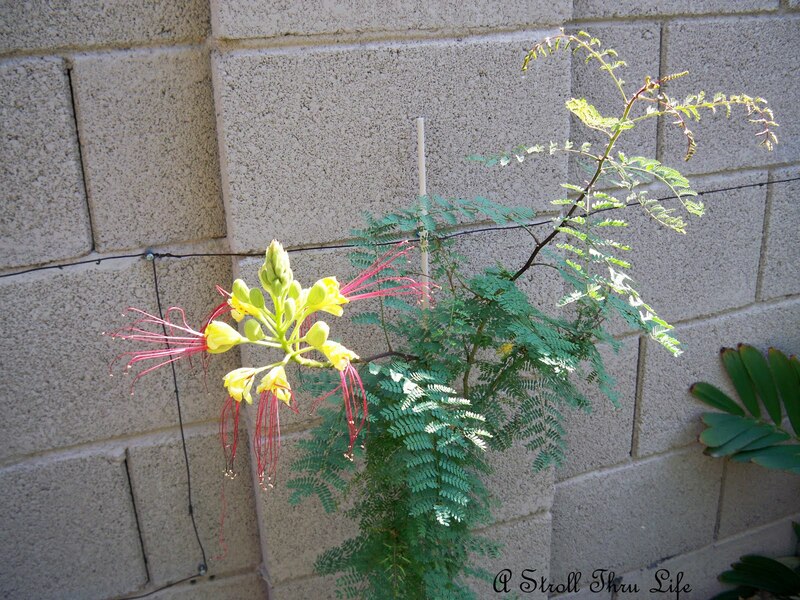 Even this tiny new shrub is trying it's best to bloom. My Amarillas on the side of the patio are blooming and I love them. Such a vibrant red. 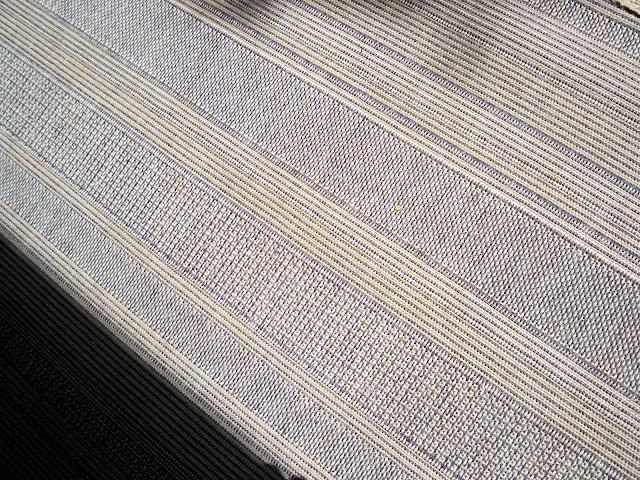 See this patio rug, it's the one I bought last year for $25, however the black and tan stripe didn't go with the new cushions on the patio. So, I simply turned it over. The back side is just shades of tan and brown. Not perfect, but it works for now. The camera makes it look more stripe than it does in real life. Ok, I'm all set for now. All that is left is to just wait and watch it all grow, that's the fun part anyway. Thanks so much for stopping by. I always enjoy your visits. I think it is all beautiful!!! I know what you mean about getting the yard in shape before the HEAT arrives! 95 degrees today.....and thunderstorms just rolled through! 77 for tomorrow! If I do not get things planted AND established before the middle of June...you can forget it! They just survive until fall. 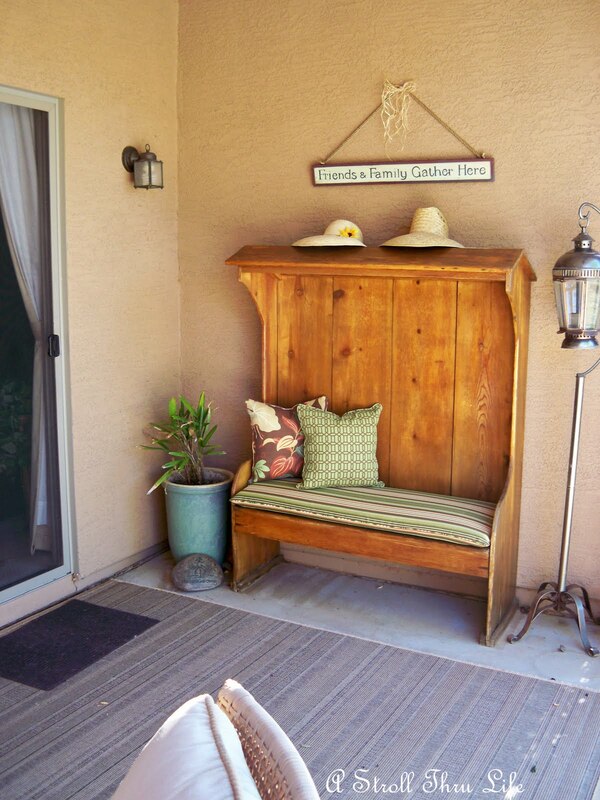 Love the bench.....I can so see having morning coffee out there! Just beautiful, have fun just sitting around and relaxing. ORB is my best friend! The bench looks very fresh now, Marty. How wonderful to be in nice warm weather! It is rainy and dismal here. Your yard is looking really nice! How fun to have turned your rug over to coordinate colors. Your flowers are beautiful, and the makeover on that bench is impressive. I am so envious of your temperatures. We have snow again today. Spring has not sprung in WI! Really nice. An invite to sit awhile. The yard looks incredibly cozy and the bench painted black is perfect! Everything looks wonderful! I love your yard and I agree, the bench will be a perfect spot for enjoying a cup of coffee in the mornings! It's nice to be ahead of the game. 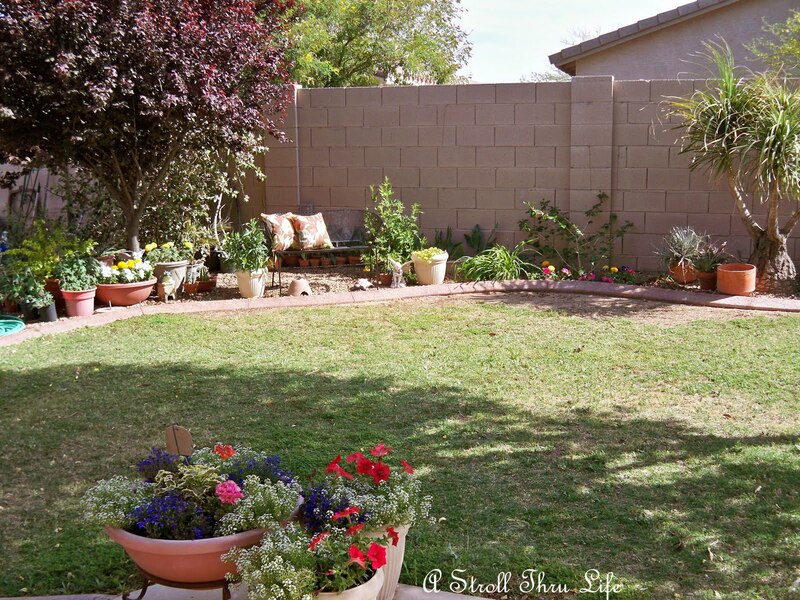 Your yard looks wonderful...you should be glad to have a small one...a large yard can be cumbersome to take care of. I really like your bench and the flowers around it, what a sweet place to sit! Your yard and the bench looks great! I definitely need to get some of the Orb spray paint as I have several things around here that need some help. Your hard work has paid off, everything looks so nice and a relaxing sitting area. And grow they will,you have a green thumb, and an eye for beauty.Your yards are as lovely as your home. 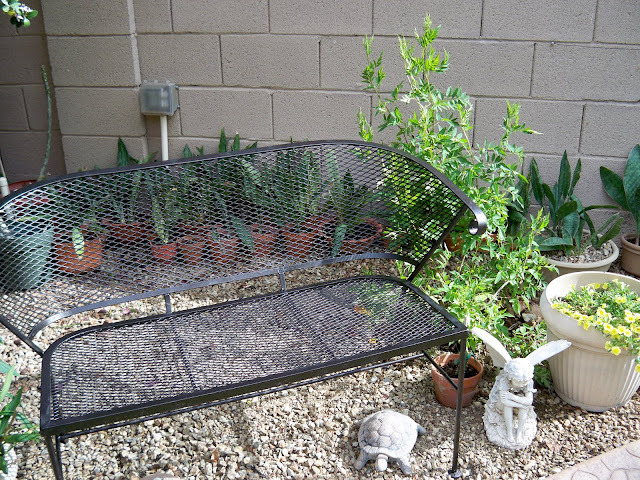 Love that garden bench painted black and the little turtle is too cute. Marty, everything is just wonderful wish I had the wall fence in my yard, they don't make them like that here... love the iron bench. Marty, it looks like you are ready! We hit 95 today in my part of Texas, sounds like you are having some of the same weather. Not looking forward to summer if this is what we have in April. Your yard looks so pretty Marty. Not sure I could handle your heat down there though. I'd be stuck inside looking at the garden through the windows. i can see you sipping lemonade on your pretty bench. Happy Easter and enjoy the wedding..you will look amazing! Love that bench!! ORB can fix any problem! Everything looks really great, Marty. 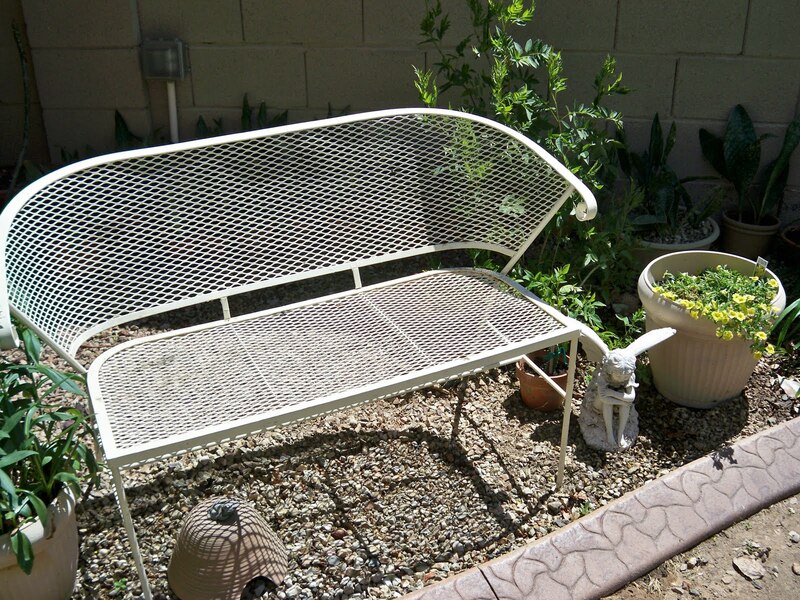 I'd love to find a bench like that for my yard. What a great find! your bench looks great, what a bargain! You have such a lovely yard Marty and I'm just loving that black bench! Great choice in color. Your flowers are beautiful too! Your yard looks soooo pretty...love the black on the bench. I'm so envious of your warm weather. Coffee on that bench in the morning sounds like heaven. We're still having mid-30's in the morning!! Your backyard looks great! You have been busy. I have trying to get some things planted in my backyard. Hopefully after the round of storms we are expecting passes thru I can plant more! Marty, the bench looks great in ORB and with the pillows! I love the way you turned the fabric over to get the right color. Great job! Your plants are looking great too. You have done such a fabulous job in your yard! Boy do I love seeing all of your plants, and the pretty new pillows and garden decor! I really prefer a small yard myself and I love the way you have landscaped yours. Very pretty. 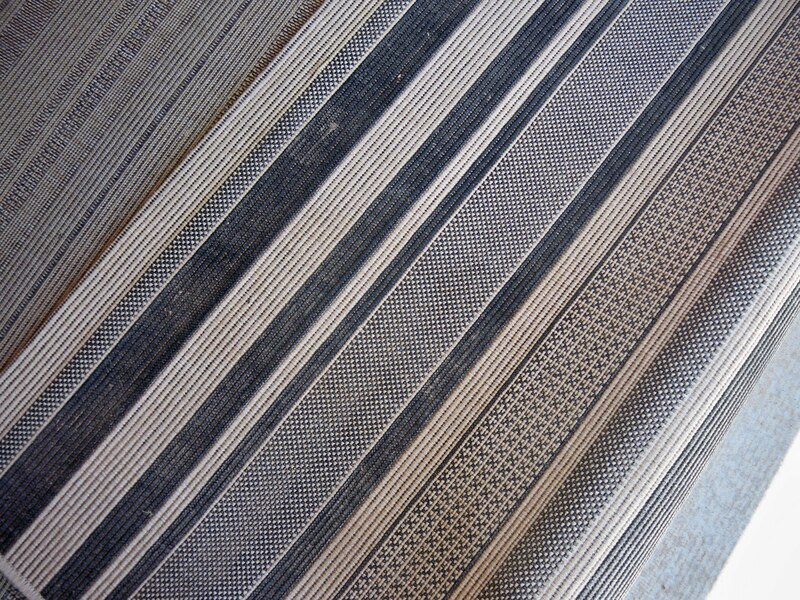 Your bench looks great in black Marty and it was absolute genius turning that rug over~! Enjoy every moment in your beautiful yard.. Your yard looks beautiful. I too am hoping to get a lot of enjoyment out of our yard before the 100's which won't be too long now. Your flowers are so pretty. Enjoy it while it lasts! Everything looks so nice. We are still having cool rainy days. I get excited when it hits 50 degrees. You are so lucky and everything looks great as usual. I love the bench with its makeover. I couldn't agree more about ORB. If I had son, I believe I'd name him Orbie. Marty, your yard is looking great and I love the shape of your bench. Already in the 80's here, too. Going to be a hot summer. I would love to have a smaller yard. Ours is too big and needs lots of work. Thanks for joining my party. Hi Marty...Thanks for stopping by. I have snow and your heading towards the 100's! Your yard is always gorgeous ...something we Northerners can only aspire to! Hi Marty! We are doing the same thing! I think most of us are. "Fluffing the pillows" so to speak, and in your case, actually making them! Everything looks lovely. The idea of making our patio's into sort of rooms has really caught on and I love it. What a great way to extend out living space. Happy Easter, Marty dear! Nothing like a little paint and a few yards of fabric to give something a NEW look! This is definately going to be a hot summer. We are starting off our days at about 75, and ending up in the high 80's/low 90's. Your yard looks very pretty and the bench redo really improved the look! We haven't bought plants yet. It was 77 degrees at midnight last night and 38 when I got up this morning. It is too crazy here to plant things yet...hopefully by the weekend! Looks wonderful. We had many storms of late and so ahve not gardened much , Today is coller but is will get hot soon. Read my blog and follow it. Hi Marty....your yard looks perfect...so inviting! It's just plain cold with winds blowing and rain starting again today in Arkansas.....I know when it ends it will be 100 in no time at all, but this cold is getting old! Well you yard looks just so pretty! Since we are still getting snow here, I am just drooling over all of you in the South/Southwest with flowers already! Marty your yard rocks!! You are one talented lady!! It's really warming up here too Marty. I had the AC on today. Love that little bench. I could use something like that under my magnolia. 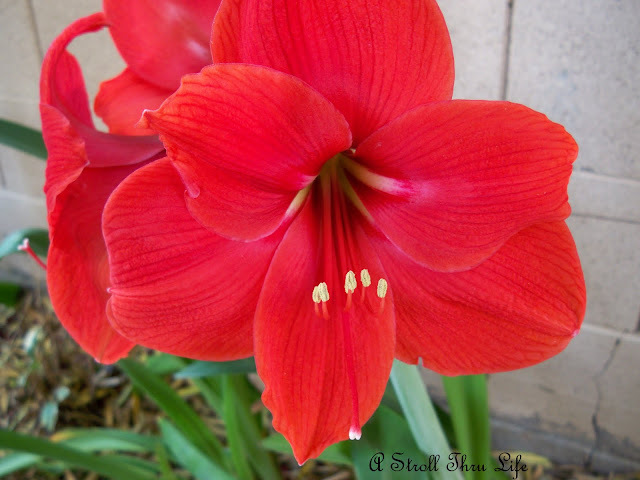 My amaryllis has bloomed too. I need to go out and take some pics before the fade. Yours is beautiful. That looks awesome. In time everything will grow up. I hope it doesn't get to the 100s too fast. Have a great day. Hugs. Marty, your garden looks so neat and welcoming! Yes, our weather is warming up pretty quickly too. I better get my outside chores done before it gets too hot to even go out side! Happy Earth Day! Marty, Love your garden and isn't that oil rubbed bronze the best? I love how your bench turned out.